Chicago, 1989. A warm August day. In the shadow of Altgeld Gardens, in a church on the South Side, a lanky, charismatic, 28-year-old lawyer addresses a small group of community organizers. His name is Barack Obama, and from the minute Parker Sawyers, the actor playing him, drops his first “listen,” we believe the illusion—the feeling that we’ve managed, somehow, to fall backward in time to witness an early speech, a miniature “yes we can” pep talk from the man who will be president. And yet for as much as he evokes the famous figure he’s portraying, Sawyers doesn’t approach the speech like a preemptive State Of The Union address. His Obama, still two decades from the Oval, is a young man first, a future leader second. All he wants at the moment is to inspire some local activists. Oh, and maybe also to impress someone specific in the audience: a smart and very serious co-worker named Michelle Robinson (Tika Sumpter), who he’s persuaded to spend the day with him. 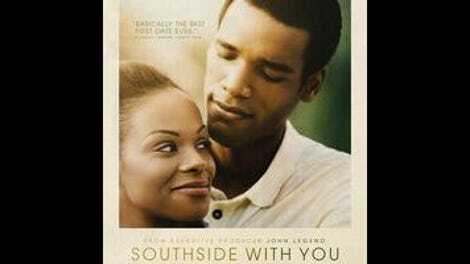 If Southside With You has a big hook, it’s the smallness of its scope. This is no Great Man biopic, no origin story of the most powerful politician in the world. Instead, the first feature from writer-director Richard Tanne is sweetly speculative historical fiction—a date movie with some very recognizable lovebirds. Dramatizing a popular anecdote about how the president first wooed his first lady, the film sends the young Barack and Michelle on a walk-and-talk outing across Chicago, as they chat about their lives, their ambitions, and their responsibility to the city. It’s a bit like Before Sunrise, only with the leader of the free world in the Ethan Hawke role. It’s also something of a valentine to the country’s love affair with the first family—and given its release in the home stretch of an election year, a memorial for the same. From the moment Sawyers appears on screen, lounging on a love seat with a cigarette in hand, it’s clear that the film is infatuated with the very idea of Obama as a pushing-30 bachelor. Back in the Windy City for a fellowship after a few semesters at Harvard, young Barry has convinced Michelle, his adviser, to accompany him to the aforementioned community meeting. What he hasn’t told her is that there’s a few more items on the agenda, including a visit to an art installation and a picnic in the park. This doesn’t sit well with Michelle. As the only black woman at the Chicago law firm where they both work, she’s intensely concerned about being taken seriously; an office romance might compromise her hard-won professionalism. “It’s not a date,” she tells Barack, early and often. But as the two spend a few hours getting to know each other better, her resolve begins to weaken. There’s an occasional clunkiness to Tanne’s screenplay, which keeps stuffing the characters’ mouths with factoids from their respective biographies. Then again, we are watching a first date, so some formal exposition—the whos and whats and wheres of lives not yet famous—makes sense. Less justifiable are the moments when Tanne winks at events his protagonists can’t possibly predict, as when Barack thoughtfully remarks, “I just feel like something else is pulling at me.” Still, it would be silly to pretend that much of the film’s power doesn’t come from a knowledge of what the future holds for these two. Shot on location in many of the neighborhoods where it’s set, Southside With You hints at the impression the city and its residents will make on the Obamas; it’s an idea borrowed from The Motorcycle Diaries, except that these two are both fleshed-out characters, not blank slates to project a philosophy onto. None of this would work so well were it not for the perfectly cast leads, both of whom get the mannerisms right without lapsing into impersonation; it really feels as though we’re seeing the Obamas as twentysomethings, still aging into the people we regularly watch on our televisions. Sawyers, who bears a certain resemblance to Obama, has the flashier of the two roles, mainly by virtue of getting to play the president as a maturing ladykiller—smooth, passionate, and also pretty proud of his silver tongue. But Sumpter, probably best-known for the Ride Along movies, has a trickier task. Doing a lot more than just replicating the first lady’s sharp, precise enunciation, she keeps her character’s best judgment and growing affection in perfect equilibrium, as Michelle tries to fend off feelings for the decent, complicated guy pursuing her. She puts up a good fight, but the battle is probably lost very early, right around the time she catches a glimpse of Barack in the rearview mirror of his beat-up Nissan Sentra. It’s a fleeting, beautiful shot with a timely resonance: Come late January, the couple’s time in the White House will be in that rearview mirror, too.